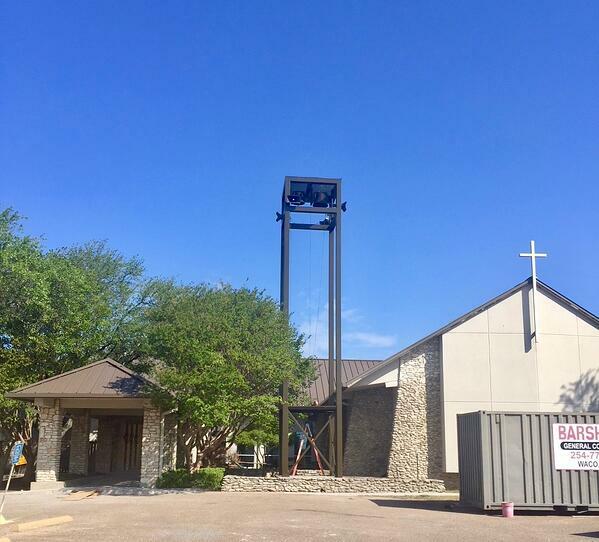 A refurbished bell tower is being erected in a new location as construction nears completion at Holy Spirit Episcopal Church in Waco, Texas. The original tower was located at the back of the church courtyard. It would have been in the way of the planned expansion, so the decision was made to refurbish and relocate the tower to the front. The relocated bell tower is part of a major improvements program that was envisioned in the 2017 master plan. The firm has been working with Holy Spirit and Barsh Construction to implement extensive renovations and expansion of the existing mid-century modern worship space. The work will upgrade the nave and gathering area (also knows as a narthex) while improving the site drainage and parking. The project includes new bathrooms and mechanical upgrades.